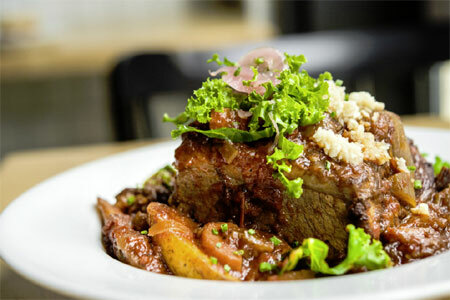 Savor Tuscan flavors at this sophisticated Italian eatery in the East Village. : Located deep in the heart of the East Village, a far cry from the downscale honky-tonks and falafel joints that once pervaded this part of town, this sophisticated Tuscan bistro serves up satisfying fare. The look---exposed brick walls, beamed ceilings, brick pizza oven, handcrafted pine tables and chairs, a quiet back garden---and the authentic Tuscan food, prepared by Maristella Innocenti, are equally appealing. On the daily-changing menu, expect fresh-baked breads---try the grilled Tuscan bread with melted Taleggio cheese and figs---and pizzas, hard-to-find Italian wines and cheeses, pastas (go for the pesto blanco) and such earthy entrées as wild boar stew served over polenta or fish stew with grilled garlic bread. The owners take immense pride in their restaurant, having completed most of the construction and design themselves.